Winter brings a number of driving hazards, but one tends to rear its ugly head after the snow is melted and signs of spring return – the dreaded pothole. A close encounter with a crater can lead to wrecked tires, wheels, and suspension components. 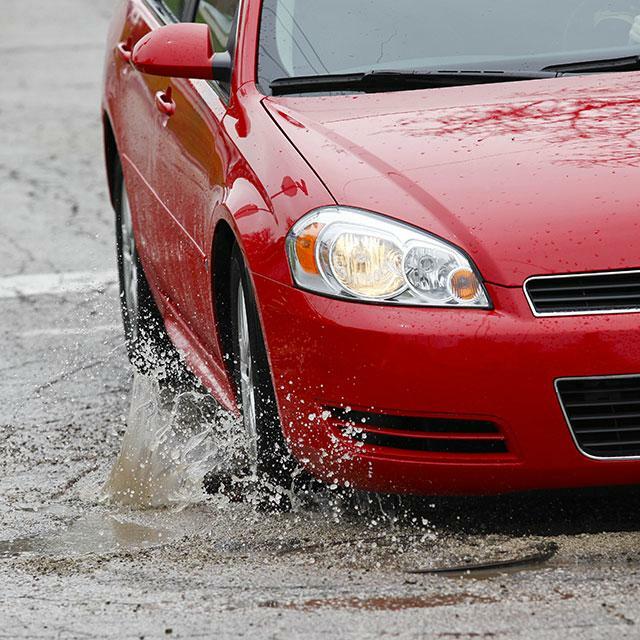 A State Farm study shows that vehicle repairs from damage caused by a pothole can cost drivers, on average, anywhere from $300 to $700. Potholes, chuckholes, chasms, or whatever you call them in your region can occur in any climate. But they’re especially prominent this time of year in areas known for ice, snow, and below-freezing temperatures. The freezing and thawing cycles allow moisture to seep into the road surface, which causes the road to crumble. Try to take roads you know well. Your familiarity will help you avoid potholes. When driving at night, travel on well-lit roads so you can see the surface. Slow down. Give yourself a chance to see the pothole and avoid it before you’re in it. If you hit a pothole, carefully inspect your tires and wheels for possible damage. Note how your car handles afterwards. If it “pulls” one way or the other or the steering feels wobbly, you may want to have your car checked by a professional. If you can’t avoid a pothole, do your braking before impact. There’s less damage when a tire is rolling than skidding over a hole during braking. Potholes can create even larger issues for motorcyclists. The National Highway Transportation Safety Administration recommends riders go around such hazards, and to do so safely, you must be able to spot a pothole from a distance. Slow down before reaching the obstacle, and make sure you have enough room before changing direction. This entry was posted in All the Buzz - Bee Informed, Bee Smart and tagged Insurance, State Farm, Transportation on March 4, 2015 by massacbeeswax.